This particular wire is produced on a metric scale; therefore, the finished wire diameters are not an exact match our other wires. However, the closest American equivalent measurements are 18 gauge (1.02mm), 20 gauge (.82mm), 22 gauge (.65mm), and 26 gauge (.41mm). 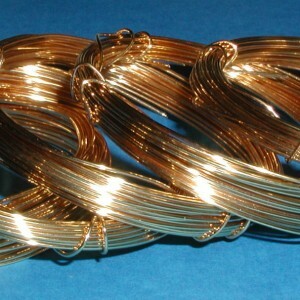 ParaWire is proud to offer top quality, German made, gold plated copper wire. This wire is a great alternative to using solid gold wire. Please inquire directly through our contact page if you are interested in purchasing larger quantities, or solid gold wire from us.